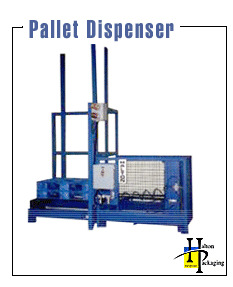 Pallets are placed in the pallet dispenser (or pallet stacker) from the front or side. The pallet dispenser holds 10 to 16 pallets and is operated by two air-cylinders (no gears, motors, sprockets or special linkages required). When dispensing a pallet, two forklift truck tines are inserted into the next-to-the-bottom pallet. The stack is raised, leaving the bottom pallet. This pallet is conveyed on the flat wire mesh conveyor (or roller conveyor) to the staging area between the dispenser and the pallet elevator.